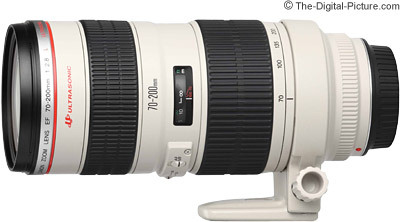 The Canon EF 70-200mm f/2.8L USM Lens is a middle child in the very popular Canon L Series 70-200mm family. The 70-200mm L lens family shows many genetic similarities aside from their obvious focal length range similarity. Top notch image quality with build quality to match is at the top of the list. All have constant wide apertures (f/2.8 or f/4) over their entire zoom range. All feature fast, quiet and accurate autofocusing benefiting from Ring USM (Ultrasonic Motor) and internal-focusing. All four are internal zooming lenses - the physical length of the lens does not change throughout the zoom range. All four share 8-blade apertures (though the IS lenses features a round aperture) for excellent out-of-focus blur quality. The primary benefit the Canon EF 70-200mm f/2.8L USM Lens offers over the Canon EF 70-200mm f/4L USM Lens is a 1 stop faster aperture. Letting twice as much light through the lens is more than a small advantage, but there is a cost to this extra f-stop - in size, weight and price. The Canon EF 70-200mm f/2.8L USM Lens is about 1.3 lbs (605g) heavier, .8" (21.6mm) longer, and .3" (8.6mm) wider than its smaller sibling. The actual numbers are 3.3" x 7.6", 2.9 lbs compared to 3.0" x 6.8", 1.6 lbs for the f/4 or 84.6mm x 193.6mm, 1310g compared to 76mm x 172mm, 705g for the f/4. The faster f/2.8 aperture is helpful for isolating a subject from a distracting background and for gaining action-stopping shutter speeds (the action can be from the photographer or the subject). At 200mm, f/4 can blur the background, but f/2.8 can provide more blur. 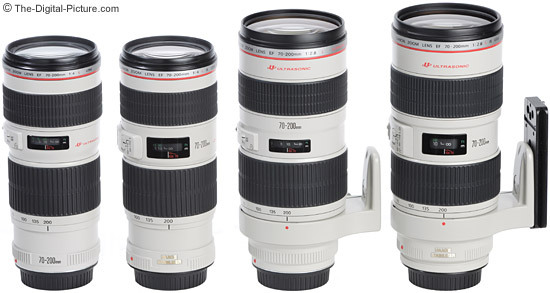 The primary benefit the Canon EF 70-200mm f/2.8 IS L USM Lens has over the non-IS version is IS (Image Stabilization). 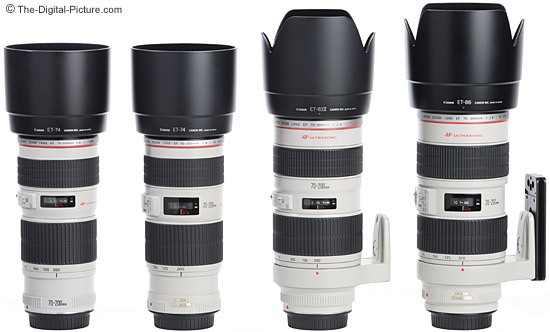 (note: the Canon EF 70-200mm f/2.8L IS II USM Lens has replaced the version 1 lens and adds image quality to the advantage list). Aside from the feature, the most significantly difference IS makes is in the price tag. Otherwise, the IS version adds .1" (1.6mm) to the diameter, .2" (3.4mm) to the length and .34 lbs to the weight of the lens. The specifics are: 3.4" x 7.8", 3.24 lbs (86.2mm x 197mm, 1470g) for the IS compared to 3.3" x 7.6", 2.9 lbs (84.6mm x 193.6mm, 1310g) for the non-IS lens. I don't notice the difference in size and weight when using these lenses - you have to determine if the value of IS is worth the price to you. It unquestionably is to me personally. Even in decent lighting, I like the added insurance IS gives me if I get a little sloppy at typically-hand-holdable shutter speeds. Unlike its IS sibling, the Canon EF 70-200mm f/2.8L USM Lens is not fully weather-sealed - Extra caution will need to be taken in wet conditions. The 70-200 f/2.8L lens is, however, a partially weather sealed lens. A lens mount gasket is not present, but the switches, focusing ring and zoom ring have moderate dust and moisture resistance. A front filter should be used for sealing purposes. The same lenses once again - this time with their included-in-the-box lens hoods. The Canon EF 70-200mm f/2.8L USM Lens is sharp wide open and even sharper when the aperture is closed down a stop. At most focal lengths, corners are slightly soft until the lens is closed an additional stop. This is one of the lenses that I have received comments on regarding the ISO 12233 resolution chart samples - some think they are too soft at f/2.8. As I get time, I retest questionable results - Or even buy another copy of the lens to insure accurate but expectable results. I re-tested this lens and the Canon EF 70-200mm f/2.8L IS USM Lens at the 200mm focal length using AF, MF and bracketing - obtained results were identical. The chart is tough on optical performance, and real life images do seem sharper. The Canon EF 70-200mm f/2.8L USM Lens is often reported to be sharper than the Canon EF 70-200mm f/2.8 IS L USM Lens. The difference is said to be caused by the extra lens elements in the IS version. Any center-of-the-image advantage the non-IS lens has is not significant on my Canon EOS-1Ds Mark II. And, the middle and edge image quality from the IS lens is better at the longer end of the focal length range. My subject is seldom in the center of the frame, so corner image quality is more important than center-of-the-frame image quality to me. Even with a 1.4x or 2x extender attached, I could not see much difference between these two 70-200 lenses. I've had two copies of this lens - both performed similarly. Very minor barrel distortion is present at 70mm. Pincushion distortion is present by 135mm and moderate at 200mm. Color and contrast are excellent. A small amount of CA is noticeable at the 200mm edges. Vignetting is very minor even at f/2.8 until 200mm where full frame camera body users will notice some corner darkening at f/2.8. Pictured above from left to right are the Canon 24-70mm f/2.8L USM Lens, the Canon EF 70-200mm f/2.8L USM Lens and the Canon EF 70-200mm f/2.8L IS USM Lens. 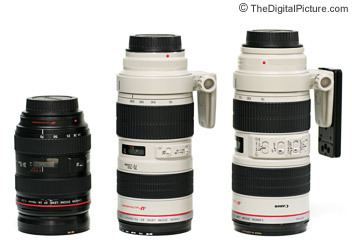 The Canon EF 70-200mm f/2.8L USM Lens is compatible with the Canon Extender EF 1.4x II and the Canon Extender EF 2x II. The 1.4x yields a still relatively fast and reasonably sharp 98-280mm f/4 lens while adding some CA and barrel distortion (a little more than offsets the 200mm pincushion distortion). The 2x extender yields a 140-400mm f/5.6 lens though results are soft with low contrast until stopped down to at least f/8. CA once again is more apparent with the 2x. Extenders are a relatively inexpensive option to increase the usefulness of an already useful focal length range. The 70-200 f/2.8L has the smallest maximum magnification value among its siblings - .16x at 4.9' (1.5m) vs. .21x at 4.6' (1.4m) for the IS, .26x at 3.9' (1.2m) for the f/4 and .21x at 3.94' (1.2 m) for the f/4 IS. A 25mm extension tube will significantly help the 70-200 non-IS' closeup capabilities (.41x) while a 12 mm extension tube will help only very minimally (.22x). The Canon EF 70-200mm f/2.8L USM Lens feels great in your hands. The build quality is top notch. The focus and zoom rings are smooth and nicely sized - my 70-200 has a very slight amount of play in the focus ring. FTM (Full Time Manual) focusing is supported. A tripod collar, a lens hood and a nice lens case are included in the box when the 70-200 f/2.8L is purchased from a reputable retailer. The 77mm filter size makes sharing filters with Canon's other L zooms (and some non-L lenses as well) convenient. Another 70-200mm lens group picture - This one with the 70-200mm f/4 IS removed and the Sigma 70-200mm F/2.8 EX DG HSM Lens in its place. 70-200mm is one of the most useful and most popular focal length ranges available. Action sports photography is one of the more popular uses for the non-IS Canon EF 70-200mm f/2.8L USM Lens as IS cannot stop subject action and f/2.8 is as fast as any EF zoom lens Canon makes. Action-stopping shutter speeds (generally 1/500 or faster) are easily hand-holdable in this focal length range. The 70-200 f/2.8L silently autofocuses very fast (perfect for action sports). An autofocus range limitation switch increases autofocus performance when subjects are not close. Swimming, soccer, baseball, kids' sports ... Indoor action sports will typically require a high ISO setting with the Canon EF 70-200mm f/2.8L USM Lens, but it can be used in these situations. A Full Frame body obviously cannot frame distant sports as tightly as a 1.3x or 1.6x body and may require a 1.4x Extender for larger-field sports. While many think wide angle lens when landscape photography is mentioned, the 70-200mm focal length range is frequently employed to capture beautiful landscape shots. John Shaw's most used nature and landscape photography lens falls within this focal length range. Portrait photography, street photography, a walk in the park, a day at the beach and other similar uses are perfect for the 70-200 f/2.8 L.
If you need a lens in the 70-200mm focal length range that is faster than f/4, but can't afford or don't need IS, the Canon EF 70-200mm f/2.8L USM Lens is perfect for you. This is an excellent lens.